We hold thousands of archival photos from the late 19th Century to the present, capturing life in New South Wales in much of its richness and diversity. This is a picture book showcasing a selection of these images. 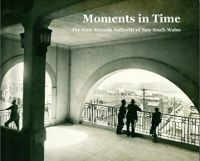 It was though our "Moments in Time" blog series on Archives Outside that we were inspired to create this book. The blog series asks a question each fortnight "Can you date this photo?" and much enjoyment and head scratching ensues over who can identify the images and how. Images in the book are from the "Moments in Time" blog series and our Flickr account and throughout you can read comments from our blog visitors and Flickr users.